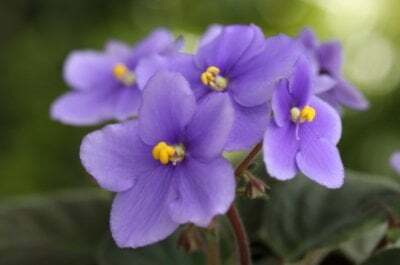 African Violet Plants (Saintpaulia) are perennial flowers that are native to eastern Africa. They are winter flowers that grow well indoors. These plants do not survive outside in most climates throughout the United States therefore they should not be planted outdoors. They require consistent temperatures between 65 to 75 F. You want to avoid getting them too cold or too hot. The leaves of this plant are a soft furry texture. They are larger than the actual flowers, and oval shaped. Most of the leaves grow in either a medium or darker shade of green. The petals of the African Violet flower feel like soft buttery velvet. The plants grow in colors of purple, pink, white, blue, red, yellow, and cream. Some of the flowers grow in two or more colors. They can also grow to be single, double, or semi double shaped. The petals can also be rounded, ruffled or fringed. Sometimes the petals are shaped in five flat petals, or five cupped petals. Certain African Violet plants have a white outer edging on the petals. It is easy to learn how to grow African Violets however care is important so if you grow this plant outdoors it can only survive in temperatures between 65 and 75 F. If the weather gets too hot or too cold, the plant will begin to wilt. Since this plant is very fragile to temperature it is recommended to only grow it indoors. When planting African Violets in a container make sure it is 1/3 the diameter of the plant. You do not want to use a container that is too large for the plant. Make sure the plant is placed in soiless potting mix which is well-drained. Once per year you will need to repot your African Violet in either the same container or a new container. If you use a new container make sure it is the same size as the previous one. When growing your African Violet plants indoors, make sure you give it either filtered sunlight or place it under fluorescent lights. You don’t want it to get too much light. Just enough for it to be comfortable and grow well. If you are using artificial light about 12 to 15 hours a day is plenty, keep the light around 10 inches above the plant. If the plant is receiving too much light you will be able to tell by the way the plant is growing and reacting to the light. The plant will not bloom right, and the leaves will droop and begin to yellow, they will also have a burned looking edge on the leaves. This means you are giving it too much light. Too little light is also a concern, the plant will not flower properly and the leaves will turn a dark color. African Violets also do best in a humid environment. When the plant begins to grow, it only requires water once every few days. You will be able to tell by the texture of the soil. If it feels dry to the touch, then give it some water. If it feels moist, do not water it. You should add a liquid fertilizer every two weeks. African Violets are classified into five different sizes according to their diameter. You have many choices in sizes with the African Violet, so pick the type that will best fit the area where you want to keep the flower. African Violets are not very tall since they have very short stems. 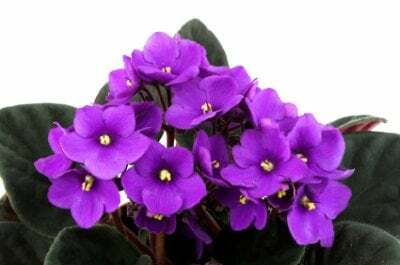 Enjoy the African Violet house plant during the winter. If you take good care of it, it can last you a very long time.